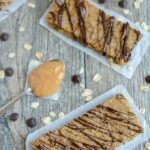 These Peanut Butter Chickpea Bars are perfect for breakfast or an after school snack. They’re healthy, kid-friendly and easy to make. Plus they’re vegan, gluten-free and dairy-free! 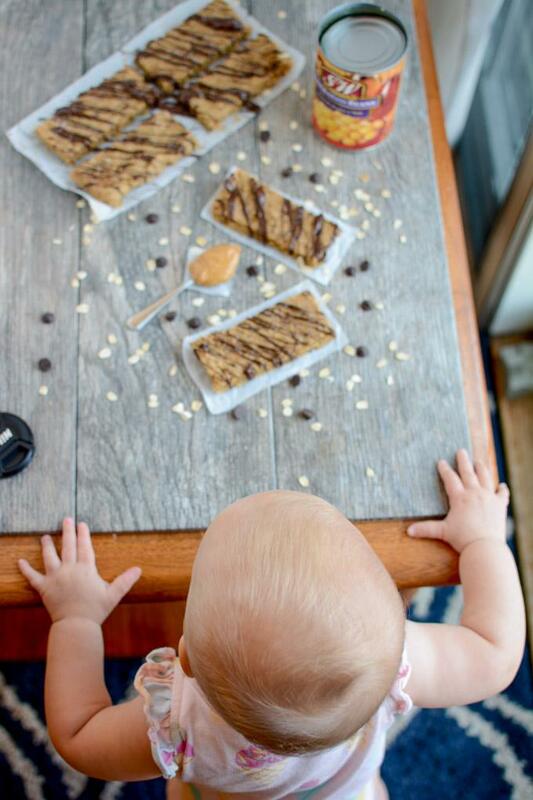 Allow me to introduce you to a new favorite snack at our house: Peanut Butter Chickpea Bars. With back to school season approaching, I’ve had a couple requests for recipes that are good for packed lunches and after school snacks. These bars certainly fit the bill! I’d been wanting to create something with the peanut butter chickpea combo for a while now. I was able to nail the flavor and consistency of these bars on the first try but finding a baking vessel took a few tries. The first time, I baked them in a 9×9 square pan and they were just a bit too thin. The next time I tried them in a loaf pan and they were way to thick. The third time, I baked them in the 9×9 pan and just left about an inch or so of the pan empty on one side and that got them to my desired thickness. They don’t really spread out while baking so it’s easy to leave some open space. You could also try them in an 8×8 pan. I drizzled mine with chocolate but you could leave that off if you wanted. You could also mix some chocolate chips into the batter which I’m going to try next time. I took these pictures while Little Miss was awake and was quickly reminded why I usually save photos for naptime. She made it quite clear when she was ready for the photo shoot to be over…and even helped herself to a bar. I’ve got a pint-sized boss who runs the show around here. She lets me know when my photo shoots have gone on long enough! 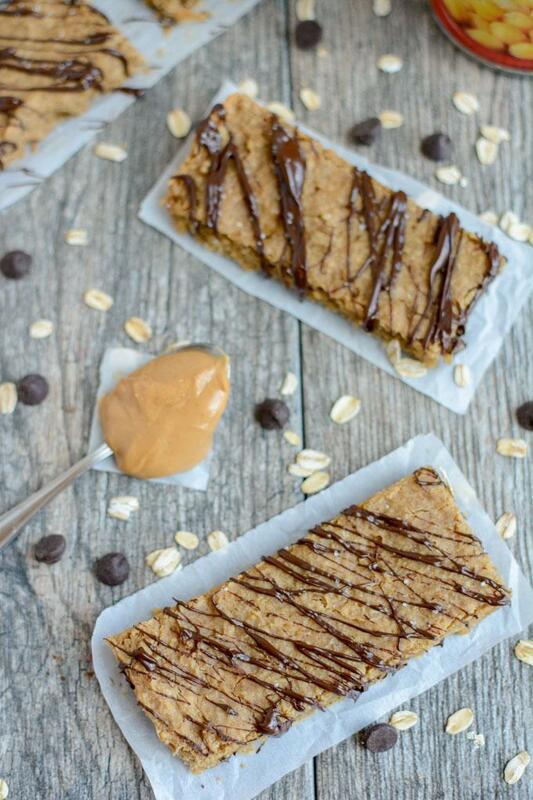 Peanut Butter Chickpea Bars coming soon. Baby & toddler approved! Place the oats in a food processor and process for about 30 seconds. Add chickpeas and pulse several times. Add remaining ingredients and process until well mixed and a ball starts to form. Scoop the dough into the middle of the pan. It will be pretty sticky. Get your fingers wet and then work quickly to spread the dough to the corners of the pan. You may need to re-wet them a couple of times. Leave about an inch open on one side of the pan. Let cool, cut into 8 bars, drizzle with melted chocolate chips and sprinkle with sea salt. I would recommend taking a taste of the dough before you put it in the pan. If it’s not sweet enough for you, you could add a little more maple syrup but both of my kids liked these just fine. These look incredible!!! LOVE how gooey and dense they look! What size can of chickpeas for the Chickpea peanut butter bars recipe? i believe it was 14.5 ounces? I love sweets with chickpeas! They make the best everything! As long as I don’t tell my sister whats in it she likes baked goods and treats with them as well. The recipe looks awesome, and I will definitely be trying it. Am I the only one who melted at the sight of that precious baby head and chubby hands? Adorable! Could I substitute something else for the maple syrup? Like maybe honey? I love to bake with chickpeas!! These looks great – I can’t wait to make them. Any idea how much protein per bar? Thanks! What a brilliant idea! Pinned and can’t wait to try these! My three year old has been enjoying these all week. I have been calling them peanut butter and chocolate bars. 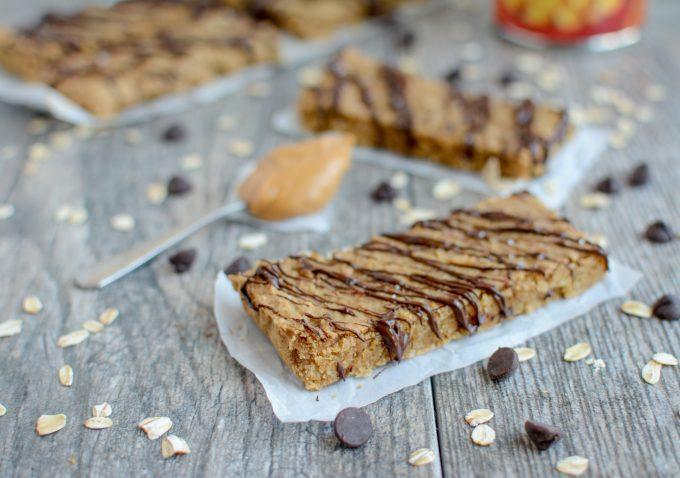 I almost slipped once and called them chickpea bars…oops! I have to make these! I think my girls would love and they’re perfect for the lunchbox! These turned out so good! My 14 month old devoured hers. I loved it too! My food processor is tiny so I just did the oats and chickpeas in there separately and then finished it all in the stand mixer. Worked great! Kids loved these! We added cacao nibs and left the chocolate off the top. Thanks for a quick and easy recipe!